Download the Workflow chart by clicking here. 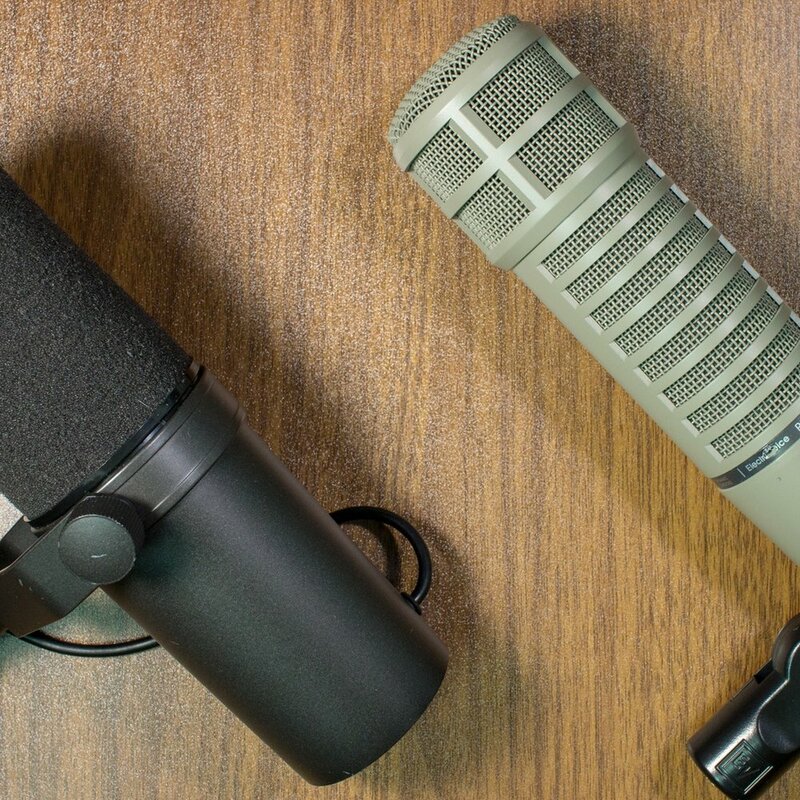 This website will help you find the right microphone for your use case. First you should watch the video that will walk you through the workflow chart to the right. This process will help you arrive at what type of microphone type will best fit your use case. Following that exercise, I have provided a list of my recommended microphones by category below to help you narrow down your selection even further. The recommendations list is not an exhaustive list, and there are many more options. I simply feel that it would be disingenuous of me to recommend microphones that I have not personally used or reviewed on the Podcastage YouTube Channel. Below are my recommendations for microphones that fall into the general categories discussed above. I have also included some audio interfaces that I think are great options. The RE20 is a flat dynamic mic that offers an extended high end, a full low end, and does a good job rejecting background noise. It does tend to be a bit sibilant and can sound a bit recessed in the mids. The SM7b is a relatively flat sounding microphone that has a dark and smooth tone. Some people think it sounds too muffled, and it rejects less ambient noise. This mic is quickly becoming one of my favorites. It has a detailed high end without sounding sibilant, and a nice full and warm low end. It does require good microphone technique as it can get boomy and it doesn’t do great at rejecting plosives. The procaster has a broad boost in the presence region of the mic, with a roll off of the air. This allows for a very clear spoken word recording. However, this mic can be considered somewhat dark, and there are complaints that it’s not the best at rejecting plosives. The SM57 mixed with the A81WS windscreen can get you a tone that is very similar to the SM7b. The SM58 is a workhorse that you cannot go wrong with. The ATR2100USB & AT2005USB are nearly identical and they two of the most popular XLR/USB Dynamic mics on the market. They are a great starting off point, but offer a slightly nasal tone. They also lack a little bit of detail in the higher frequencies. This is my most recommended microphone. It offers XLR & USB so there’s a clear upgrade path, it offers more clarity in the high end, and sounds less nasally than the ATR2100USB. However, this mic can suffer from some slight issues with sibilance. For $20, the Behringer is far better than it has any right to be. It offers a good amount of clarity, and sounds rather full in the low end. It can sound boomy and muddy if you’re close to the mic, and it also does not do a great job at plosive rejection. The TLM103 is a staple in the voice over market, and with good reason. It offers a presence boosted sound with a buttery smooth low end. It has exceptionally detail and capture voice beautifully. This microphone can sound a bit nasally for spoken word though. The Broadcaster is not a condenser mic for singing. It’s a condenser microphone for those broadcasters & podcasters who want a slightly extended frequency response to capture all the nuances of your voice as well as have a more open sounding recording. If you’re looking for a flatter more vintage sounding singing mic, this is a killer. It’s also probably my favorite microphone from Blue. It has a warmer low end and an extended high end without sounding top heavy. The AT4040 is a very airy sounding microphone. It has a full 20hz - 20kHz frequency response, and offers plenty of detail, but it has a narrow boost that leads to an airy or breathy tone. It’s still an excellent sounding microphone. If you were unaware, Sennheiser owns Neumann, and if you want that sweet Neumann sound you’d get from the TLM102 or 103, but can’t stomach the price tag, this is a GREAT alternative. The NT1 is probably my favorite condenser microphone sub $700. This is an extremely flat microphone with one of the lowest self noises on the market. If you’re looking for an uncolored, natural sounding mic, without having to worry about excessive self noise, this is the mic for you. The AT2035 is a great starting point to get into the true condenser XLR market. It offers a relatively bright tone, and a decent amount of body in the low end. This microphone is a great option if you’re recording music and need multiple polar patterns. I do NOT recommend this for podcasting in an untreated room, or for micing up multiple people sitting around a table, if audio quality is at all important to you. The c01u Pro won my best USB microphone under $100 comparison, and it’s because it sounds great for the price. These microphones are all so similar it’s hard to pick one that wins. They sound pretty good considering their price point and the fact that they are electret condensers. I ONLY recommend these if you’re connecting them using an XLR to XLR cable into a USB Audio Interface. The MKH416 is a staple for use as a shotgun microphone as well as a voice over microphone. It has a very flat mids section, and a broad boost in the treble and air frequencies to give it clarity and openness. You can also get a large boomy announcer voice if you utilize the proximity effect. The AT875r is a relatively budget shotgun microphone, but it doesn’t show it that much. It doesn’t have as large of a low end as the MKH416, but it has a similar treble and air boost which adds clarity. You can improve the lowend if you use it within a few inches of your mouth. This is a good sounding lavalier microphone that has a TRRS 3.5mm jack. So if you’re planning on plugging this into a dedicated microphone jack you will need a TRRS to TRS adapter. This is one of the cheapest lav mics you can find. It used to be $9 for a 3-pack, but it now costs $9.00 for a single, or $21.00 for a three pack. Is it the best sounding lav? No. Is it built very well? No. Will it last you long? No. But it’s very cheap, and it gets the job done. The Audio Fuse is a beast of an interface with so much I/O that you’ll struggle to find anything you can’t use it for. It has insanely clean preamps with up to 76dB of gain, capable of driving even the most gain hungry microphone. This interface has become my daily driver. It is a Thunderbolt 3 interface with two microphone pres. What really sets this apart is the plugin ecosystem. Universal Audio makes some of the best plugin emulations out there, and you get to use them with this interface. I’ve become 100% reliant on those plugins, so if you have a thunderbolt 3 plug, I’d highly recommend this. The ID4 has some of the nicest sounding preamps and D.I. inputs that I’ve heard on any interface. On top of that it’s beautifully designed, and it offers you up to 58dB of gain, with an insanely low noise floor. This mixer offers a stereo output, so you’re not going to be able to multitrack, but during my testing phase, I fell in love with this thing as it is so convenient to be able to easily mix computer playback, and up to 4 mics together into a stereo mix. It also has some fairly respectable preamps and it has some fun effects to play with. I have included this because it’s a great jumping off point for anyone who wants to improve their interface. It has decently clean preamps, a great build quality, zero latency monitoring, and it sounds great. This is the interface I use in nearly all of my reviews because it’s a perfect middle of the road interface. There are cheaper Behringer interfaces on the market, but the reason I selected this one is because I think every podcaster should be recording in 24-bit 48kHz. This is probably the cheapest interface that will get you that spec, and it offers around 60dB of gain with it’s Midas preamps. - All audio samples normalized to -23 LUFS (using Auphonic) to ensure that all audio is level matched. - Audio samples are uploaded as 320kbps MP3 files due to audio player limitation on website. 10/16/18 - Video walkthrough released & added to webpage. 10/15/18 - Audio Samples for Dynamic / Condenser / Shotgun microphones added.